My Thoughts: I liked how this novel unfolded. The story kept me and Knife (the main character who is a faery) guessing what would happen next. It revealed the plot little by little so that things only came together at the end! One of the things I loved in this book was the differences between the faeries and the humans. They lived completely different lives and didn't understand which other at all. It was exciting to read how Knife and a human got to know each other. They each had a lot of learn about the other. I liked how every character ended up being important to the story. Even the characters who seemed unimportant at first had an role play. 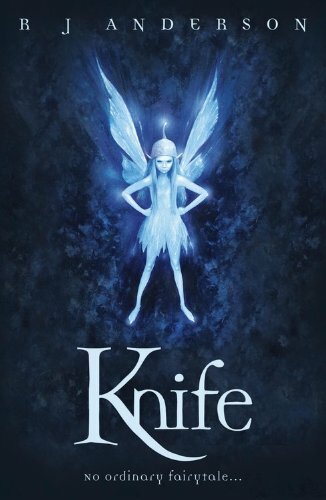 In the novel, Knife tried to find out the faeries' unknown history. She hoped that it would explain why faeries are so afraid of humans. As the story progressed, she started guessing the reason of this fear. She guessed a lot of different explanations. So many that when the truth was at last explained I didn't quite believe it! All in all I enjoyed reading Knife. I hope to find the next book (Rebel) in the library soon. With luck it will be just as good. Have you read Knife? What did you think of it? What do you think I should read next?